Anytime Fred Willard tells you that your brain is cold, damn it, you better listen. The brain training games have taken off, ever since the release of the mega-successful Brain Age and Big Brain Academy games from Nintendo. Now everyone wants to try to make you a smarter person, whether you want to accept it or not. Midway has decided to throw its cerebellum-testing hat into the ring with the release of Hot Brain, a game that takes a different route to testing out the mapping of the human mind. Instead of measuring intelligence, it actually lays out brain activity via temperatures. If a part of your brain runs cold, you're thinking like an Eskimo without a heater. (Well, a dumb Eskimo, anyway.) If it's boiling over, surprise, you're in the movie Scanners. No, just kidding, you're smart. Three modes exist in all -- practice, test and multiplayer. With each of these modes, players are able to check out a number of activities, coordinating their choices by pressing corresponding buttons on the PSP button pad. This works more basically than the hands-on Brain Age approach, but it still holds together thanks to the small but viable group of activities. One'll have you mapping out a taxi's route in a city, while another requires figuring out the pattern of shapes. Five categories -- Logic, Memory, Math, Language and Concentration -- can be chosen in all, although the puzzles do tend to repeat as the game goes on. Being able to download new puzzles would've been a huge plus here. 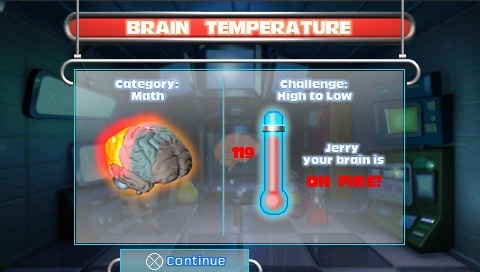 In the end, Hot Brain doesn't do enough to change your life, but it's a quirky little addition to the brain-training scene that deserves a look out of sheer boredom. The addition of downloadable stuff, along with a better variety of puzzles, would've made it more than worth the $30 price, but the multiplayer and Fred Willard make it a decent investment all the same. Besides, who are you going to trust -- some brainy doctor you've never heard of or Ron Burgundy's boss? Thought so. What's Hot: The presence of Fred "The Man" Willard helps tremendously; engaging single-player mode and somewhat fun multiplayer. What's Not: Some puzzles get old a little quickly; more variety would've been nice; basic design.